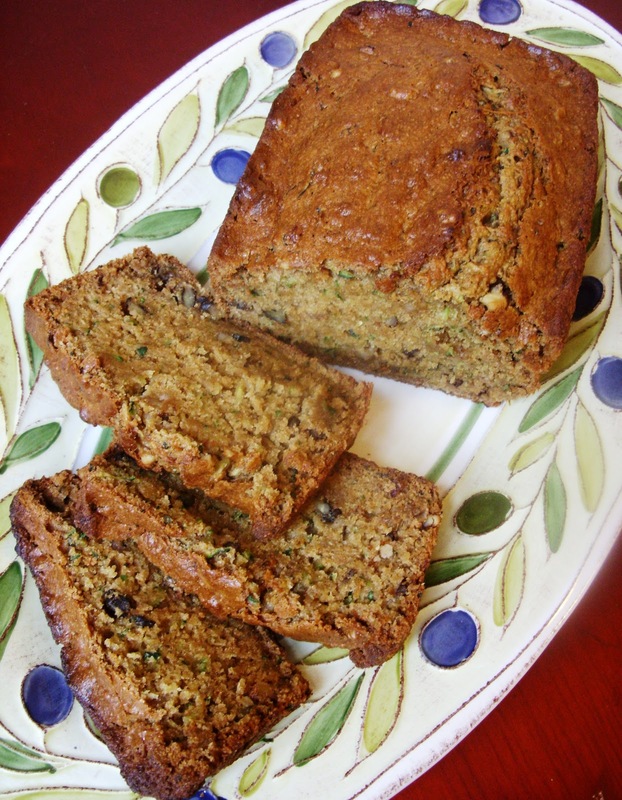 Good morning, Zucchini Apple Bread! Dan has a big ol' potluck at work today, and I have to admit that if there's one thing I miss about working in an actual office (especially the PETA office), it's potluck day! I mean true, there's always an odd array of international cuisines and multiple tofu scrambles. But in a way, it's like a sampler platter--one that usually includes vegan mac & cheez and/or salsa - two of my personal favorites. Today Dan is bringing a loaf of Betty Crocker Project Zucchini Apple Bread that was made a little larger than it should have been. See, this recipe makes two loaves. Since one will be visiting with us for a short while and only be be split between two people, and the other is going to be shared with an office of vegan potluckers, we made one loaf larger instead of splitting the batter in 2 equal portions. The larger loaf turned out a bit moister than we may like our zucchini bread, but still really tasty. The cloves and ginger really accentuate the cinnamon, and add a warm flavor to this bread. It makes it prefect for rainy fall days like today, when you realize Halloween isn't really that far away and all the good pumpkins are already gone. The point of this chatter? Well, I guess it's to encourage you make two equal loaves and not one big one. All the batter could fit in your baking dish, but in the end, I think you'll be happy you got more golden crust with the two loaves. Heat oven to 350. Spray 2 8x4 inch glass baking dishes or loaf pans with Olive Oil Cooking Spray. In a large bowl, stir Zucchini, Apple, Sugar, Olive Oil, Vanilla and Applesauce until well mixed. Then stir in remaining ingredients - adding the Walnuts last. Divide the batter in two equal parts and pour into pans. Bake for around 1 hour. Start checking on them after 45 minutes. Take them out of the oven when you can insert a bamboo skewer or toothpick in the center and remove it cleanly. Cool for 15 minutes in the pan on a wire rack. The loaves should come out of the pans easily but if they don't gently use a metal spatula to loosen the sides. You're going to want to wrap them tight in foil and store in the fridge... and don't be stingy. Even if you don't have a potluck, you have two loaves, so you should bring one to work if for no other reason than to show how good vegan baked goods are. If I had some courgettes left in my garden, I would so make this recipe today, but it will have to wait until next year.